Are you familiar with the concept of a Chinese Room? Ah, Zed. He's kind of an OP champion, but that's balanced out by how difficult he is to play: he's complex to master, and you really have to main him to make it worthwhile. You've gotta have a good laning phase or you're lost - you can't just be poking all day. Go midlane: he's a great splitpusher (especially lategame, with that giant waveclear) and can 1v1 pretty much anyone, from ADCs to tanks. He can outpace other melee champions at CSing because he's got long range and an autoattack enhancing passive. Plus his mobility gives him amazing outplay potential. Drop him into the shadows for some pure ninja juking/kiting action! Did that make sense? If not, blame the internet. We just need to sound like we know what we're talking about, not actually understand it. 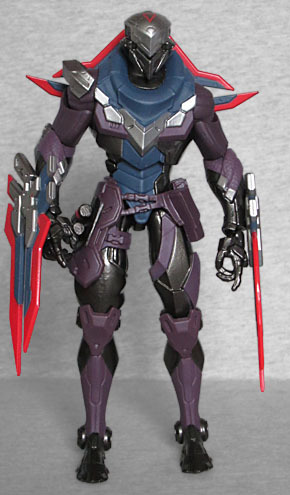 This toy looks like a cyber ninja, and it turns out that's exactly what he is. Like if there had been a comic in the '90s where Iron Man or somebody fought a villain who was designed to infiltrate that new-fangled "Inter-Net." Compare this design to to Zed's basic skin, and you can see some parallels. Metal plate over the mouth? Angled lines on the forearms? A skirt/belt thing that comes down lower on the right leg than on the left? There's all that and more. 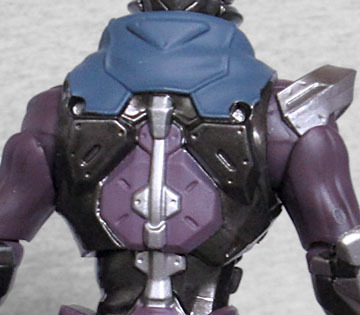 The hood he normally wears becomes a solid collar here, and the V of armor on his chest leads to only one shoulder pad, but if you're familiar with the character, you can see how this represents him. If you're not familiar with the character, well, the design stands on its own, and it does look pretty cool, yeah? 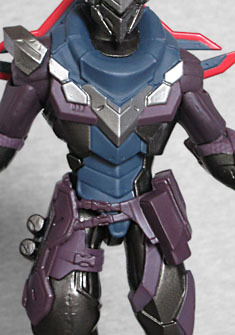 Big swords, little bit of armor, robo-ninja head... he's ready to fight Solid Snake! PROJECT: Zed's colorscheme is a nice dark combo of blue and purple, with black beneath that. "Black R.R. 'Solid Smoke' Armor," according to the people behind the game. His armor provides a touch of silver on his arms, around his chest, down his spine, and on top of his head. There's a glowing triangle outlined on the forehead, too. His weapons have bright red blades, becoming the most vibrant spots on the toy. 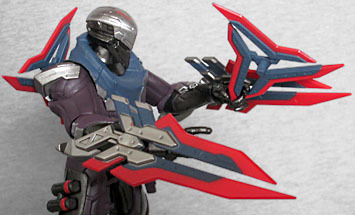 His weapons are a pair of swords mounted on his forearms, and a pair of shuriken on his back. The swords are split high frequency blades channeled via operator that maximize close-proximity damage, while auxiliary side blades allow for target laceration from multiple angles. (They've got pokey bits on the sides, is what that means.) They have pieces that look like handles or hilts, but they cannot be removed from his arms. The shuriken, meanwhile, just plug into his shoulders, so those you can remove and throw at his enemies. The Razor Shuriken attack in the game is a great way to farm, since it has a relatively large range for a linear skillshot. 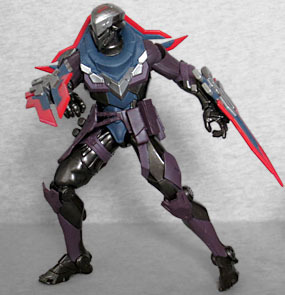 Like PROJECT: Fiora, PROJECT: Zed has the usual "Legacy Collection" articulation: hinged ankles, hinged knees, balljointed hips, swivel/hinge wrists, elbows, and shoulders, swivel biceps, a balljointed chest and a balljointed head. The upper arms were assembled backwards when I got the figure out of its packaging, but the fact that there were swivels both above the elbow and below the shoulder meant that turning them around the right way didn't require disassembling anything. Protip: the muscles are supposed to come up higher in the back than in the front. The swivels in the biceps and the wrists are surprisingly loose for a modern figure. Rocker joints in the ankles would help him remain upright in more extreme poses, and it's weird that there are no swivels anywhere in the legs, but then, balance is a lie. League of Legends has 139 playable characters. 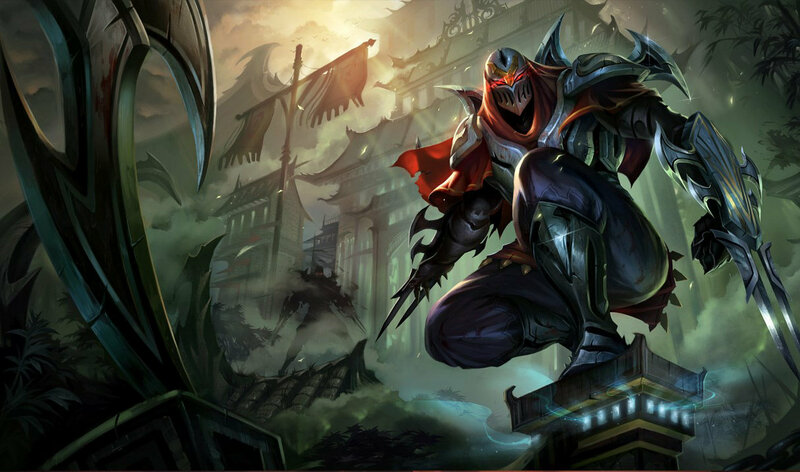 Zed, the Master of Shadows, has five different skins. That means Funko had a 1:695 chance of this toy representing anyone's favorite character, which is probably why he and Fiora are both on a pretty hefty clearance at GameStop (the only store that carried them in the first place). The toy itself is decent, if you like the design, and the price just keeps getting better.